Ce trois chambres, deux salles de bain a été rénové de fond en comble. Les condos Sea Gate sont situés dans la belle ville d'Indian Shores. Cette unité est au dernier étage et est une unité de coin surplombant le golfe du Mexique à l'avant et la voie navigable Intracoastal à l'arrière. Imaginez-vous vous réveiller le matin au son des vagues qui se brisent sur la plage, regarder la porte coulissante de votre chambre et voir les dauphins jouer dans les vagues. Cette unité a subi une rénovation complète: revêtements de sol, murs et plafonds neufs, salles de bains luxueuses avec armoires personnalisées, doubles vasques, douches en mosaïque et surfaces solides avec portes en verre. La cuisine est entièrement équipée avec des casseroles et des ustensiles pour préparer vos repas. Si vous préférez dîner au restaurant, vous aurez le choix entre plusieurs restaurants. La Master Suite a un lit king size avec une télévision haute définition de 32 'avec lecteur DVD intégré. Il a également une salle de bain privée. La deuxième chambre a une taille complète et un lit queen size et un bain attenant. La troisième chambre a un lit queen size et un balcon privé donnant sur la voie navigable Intracoastal et Gulf Boulevard. Il y a une laveuse et une sécheuse avec détergent, ainsi qu'un fer et une planche à repasser. Sea Gate a une piscine chauffée pour vous, ou si vous préférez le sable, la plage est juste. Au déjeuner, vous pourrez faire des grillades sur les grillades extérieures et vous asseoir à l'ombre sous les huttes de tiki, pendant que les enfants s'amusent dans les vagues. Il y a aussi des chaises de plage à louer et un filet de volley-ball sur la plage. Réservez dès aujourd'hui votre séjour dans la meilleure unité du complexe Sea Gate pour des vacances que vous n'oublierez jamais! Les deux salles de bains ont des doubles bols évier et douche personnalisés. Il ya pas de baignoire. Nous fournissons des serviettes de plage et des chaises de plage. The condo is an older but reasonably maintained building. The unit clearly has been updated. It is clean, comfortable and is as advertised in the VRBO listing. The views are awesome. The beach has good sand and right out the door. You can walk for miles. We would give it 4.5 stars if that was an option. The transaction was easy, and communication wit the manager was prompt. This condo was competitively priced, and for the most part everything you could want for a good family vacation. Any complaints are minor: like a slow elevator, and running out of hot water once. For bad weather days the WIFI, cable tv, local restaurants/bars/shops etc... provide alternatives to the beach/pool. 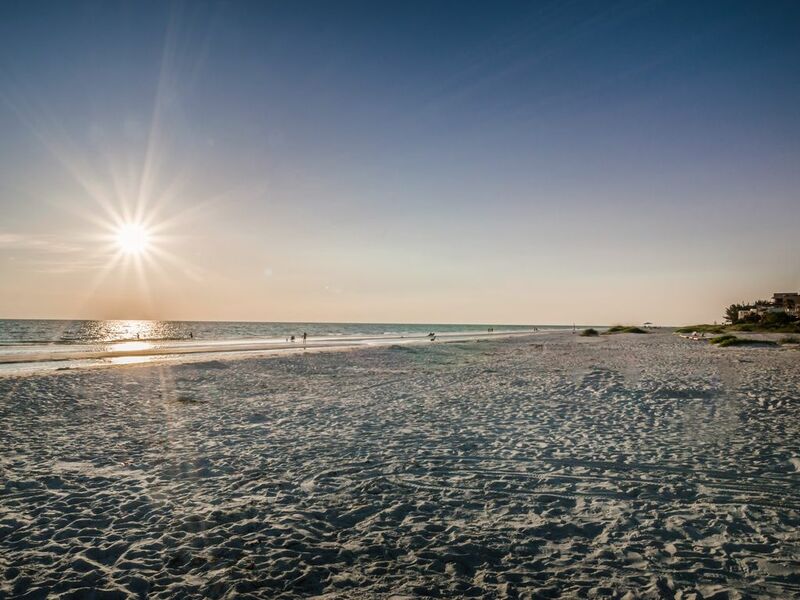 Easy access to St. Petersburg and Tampa for city activities. We would definitely consider a return stay to this place. Beautiful rooms and view. We couldn’t have asked for a better vacation spot. Condo had everything we needed, First Class. Quiet area with beautiful beaches and amazing views. Short distance to more tourist filled spots like Clearwater, Treasure Island, St. Pete,, St. Armands Circle, and Tampa. We experienced all with our stay. Would highly recommend this condo if you are looking for a clean and fully stocked accommodation. Had everything you could think of to make your vacation memorable. Perfect condo in a perfect setting! This condo exceeded our expectations! The top floor provides a spectacular view of the gulf and the beach. The condo was spotless clean and totally updated. A walk-in closet provides everything you need for the beach; towels, cooler, beach chairs, and toys. The property manager Tanya was friendly, and responsive to our questions. We would highly recommend this unit to anyone! We had the most amazing time at this beautiful condo! It was super clean and wonderfully maintained. Honestly the nicest, most comfortable place we’ve stayed at. It is beautifully decorated and included everything we needed to make our stay relaxing and enjoyable. Great view, beach, pool, beautiful sunsets...and more! The property manager was helpful and quick to respond to any questions we had. I highly recommend this property and will definitely return! Property manager was nice but won’t be back, ever. I should first off state that the property manager was very nice and easy to communicate with. Condo was filled with all amenities needed and choice for the beach, which was nice and convenient. However the stay was not great. When we got to the property all of the beds sheets were dirty with hair on them. I notified the property manager and she had them come change all the sheets. Also, the only TV that worked was in the living room. All of the TVs in the bedrooms were not operational. I notified the property manager and the cable company came out. They said everything switched to boxes – which with spectrum happened over a year ago and all properties were notified so I’m not sure why they never fix them or install them. I myself had a few properties and had all boxes. This was an excuse to me. The condo was not clean by any standards. We had to vacuum ourselves again when we got there. There was dust and dirt everywhere and the floors were not clean. Every time we would take a shower our eyes would burn. There was mold in the master bathroom shower. In the guest shower the way it was leveled water was coming out of the shower. There was a closet in the utility room which was locked and we could not open and smelled like fish the entire week. I’m not sure that the air vents were clean. Not the best experience. Won’t be back. We are sorry that you did not enjoy your stay. You are the first person to stay since we started renting this unit that has had any complaints. When you contacted me about the hair on the sheets, you had mentioned one hair, on a pillowcase. While that is not something I want my guests to find, it happens sometimes after the sheets are laundered that a hair sticks to one. We dispatched our cleaning lady immediately, and she came and changed all of the sheets in the unit. When she did so, she said that there was only ONE hair that was found, which correlated with your initial complaint. Despite our cleaning company returning to the unit, and you having several conversations with me personally, you never made mention to either of us that you were unsatisfied with the overall cleanliness of the unit. If you had, the situation would have been handled immediately. This leads me to question the veracity of your complaining after the fact. We did have to apologize that only one of the televisions worked for you, but this was not an excuse. Spectrum cable may have switched to boxes a year ago, but they only recently purchased our local cable company, Brighthouse Networks, and made the switch to boxes the week prior to your stay. While we did all we could to source the boxes, there was a county wide shortage, as thousands of people were experiencing the same situation we were. The closet that you referred to is the owners private closet where they store their clothing and personal effects. There is no fish in the closet. The unit does not need the vents cleaned, as we had a brand new HVAC system installed when we renovated the unit several years ago. The odor you were smelling was due to the Red Tide, an algae bloom that has been spreading all around the state of Florida on both the Atlantic and Gulf coasts. It causes the death of all sea life in its path, along with respiratory issues. It had just began to approach our beaches during the week of your stay. Again, I apologize that you felt that your stay was not up to your standards. We do everything we can to make sure that our units are kept clean and comfortable for our guests. All rates are subject to change without notice. NO monthly rental January- April.